It is the perfect place for families, couples and friends to relax, have fun and enjoy quality time together. Chill out, RELAX and leave the everyday stressors of life behind!! Bring your boat (or hire a boat) and keep it at your own 9 metre private jetty. Explore the magnificent and vast waterways. Go fishing, crabbing, or skiing. 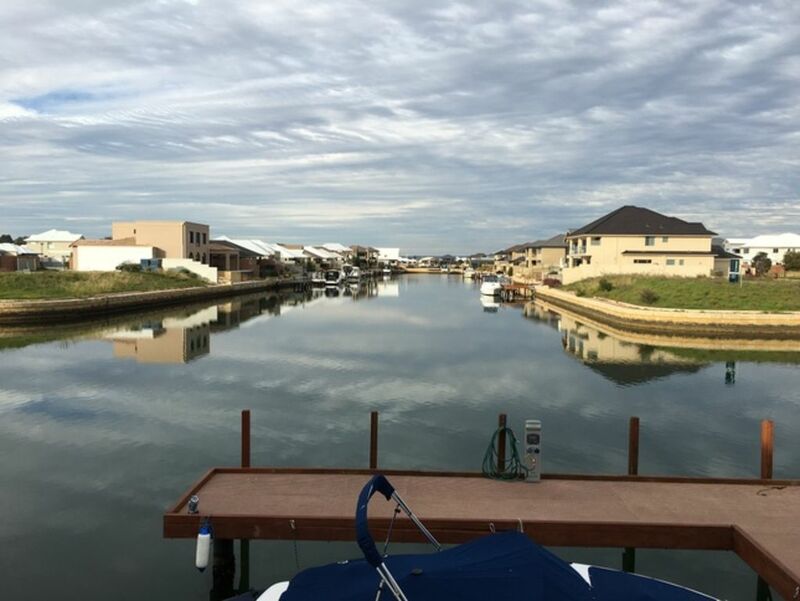 Cruise into the centre of Mandurah, or to the Mandurah Ocean Marina, and enjoy a relaxing breakfast, a leisurely lunch, or take in the nightlife at one of the many wine bars, taverns, or restaurants. Relax, enjoy and take home some wonderful memories! Long stay discount (6 days or more) does not apply over the December/January school holiday period. Absolutely amazing home with everything provided for a fun family stay. Our family gathering of 11 (including 2 little ones) to celebrate Mums 90th birthday was amazing. The house was perfect and so much to do with paddle boats, crabbing (we caught a few) kayaks and paddle boards. My son was able to moor his boat at private jetty and we loved explorating the canals. Families are well catered for and owner Tracey was so obliging and friendly with emails. Caretaker Sandy next door was helpful and friendly. We would definitely recommend and hope to go back again. The rooms are comfortable, fully functional and have fun. It is a great place for family and friends to gather together.Excellent! It’s a beautiful and lovely place! Tracey’s place has all you need! The house is so spacious and we really enjoy crabbing at the private jetty. It is the perfect place for families to relax and enjoy! A well located property that met our expectations and more. It was spacious, absolute water front with a private jetty from which many of us spent hours crabbing with pots that were provided. A couple of paddle boats and canoes kept the kids happy, and there were also life jackets of all sizes if needed. Some went for morning rides on bicycles, including a tandem, that came with the property. This property is indeed set up for a relaxing holiday. Our interstate and international family members were so impressed that they have asked us to book it again for our next family holiday. However, the Finn stand up paddle board had a hole at the bottom and we hope the owners can replace it. We did hire a paddle board for 2 days from an outside provider as we couldn't resist learning to paddle in water so calm and well-suited for beginners. Nice house, nice location. Grand children enjoyed paddle boats, crabbing and swimming. All of us enjoyed it very much. Thank you Tracey allowing us having your beautiful house for 2 nights. Thank you for our stay at your place. We had such a wonderful family trip. It suited the whole family. Perfect size for everyone to enjoy time together, but also large enough for everyone to have their own space to retreat to.